Well I am finally back to painting after a very long and serious illness. For 5 weeks I had a really bad flu with high fever, that turned into bronchitis that turned into phenomena. My husband had it too. It was the sickest I have been in over 20 years and was scary at times. All I could think about when I was sick was time. All the time I was loosing painting, designing, online, researching, marketing and so on. Time to get more medicine, time to get more tea, time to turn the heat up to 1000 degrees, time, time , time!! It snowed here in the Pocono Mountains the whole time too! At least my brain was still working while nothing else was. So with all this said about time, of course I thought of Dali and his crazy clocks. While laying there trying to sleep with no success I decided to design a Dali in my head. I was too sick to even quickly sketch it so having to keep all the details in my head, I finally fell asleep as I forgot for a few minutes how lousy I felt. I dreamed about Dail and time and in the am, "Time for Dali" was ready to go as soon as I was!! The book titles here are Dali, Clocks and Time. I love to sit in front of my fireplace with a stack of art history and artist biography books and sip and nice wine while I read and live vicariously through the artists. No, I do not do "everything" online. It is still nice to read a book. This is how I create a lot of my paintings. Can you image a whole wall like this that is a giant clock? Mr clock in the corner has a personality of his own and almost looks like he has an attitude! Hummmm.... wonder who that guy is sitting on the sofa? Can be anyone we want it to be! Enjoy! Thanks to all my friends, fans an collectors that sent such good wishes, cards and comments. It's nice to know your loved and appreciated. I'm moving slow...but I'm moving! Stay tuned, more to come. Salvador Domènec Felip Jacint Dalí i Domènech, Marquis of Dalí de Púbol (May 11, 1904 – January 23, 1989), commonly known as Salvador Dalí (Catalan pronunciation: was a prominent Spanish Catalan surrealist painter born in Figureres. Out of the hundreds of paintings created by Salvador Dali, his iconic depiction of melting clocks is no doubt the most famous. 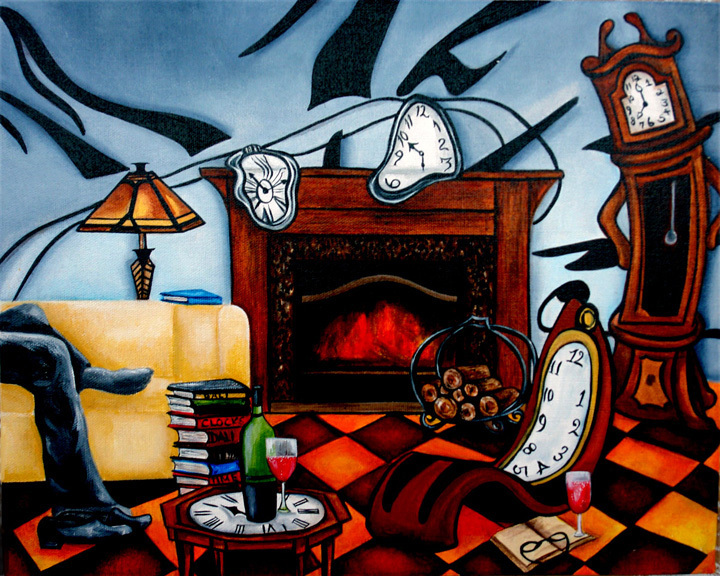 Entitled The Persistence of Memory, this painting served as both an outlet for his imagination and a simple allegory—that time is meaningless. Dali claimed (like most surrealists) that his images were “dream sequences” or inspired by his subconscious. Surrealism was a popular movement in the mid-1900s that attempted to create art which was “truer” than life. They did this by avoiding logic and reason, which were considered hindrances to creativity. It’s an idea which is still somewhat believed today. Well I guess I captured Dali's Melting Clocks! Glad to hear you guys are better, I had something similar a while back. Love all of these 'in the style of' works, but pity they all say sold (kidding about the last part). Thank you Eric. I hope I never get that sick again. Thanks for your comment. If you see something that is sold that you like, I can repaint a similar for you.